Just thought I would check in here and say hey! Been lurking on the forum for a while gathering info. I currently ride a '16 Triumph Tiger 800 XRx Low but I am looking to sell it and get a Hyperstrada. With a baby on the way and my back problems I won't be able to use the Tiger the way it was meant to be used, no touring or off roading for me any time soon. So I figure the Hyper will suit my riding needs much better than the Tiger, riding in town and a day or 2 in hills every month. 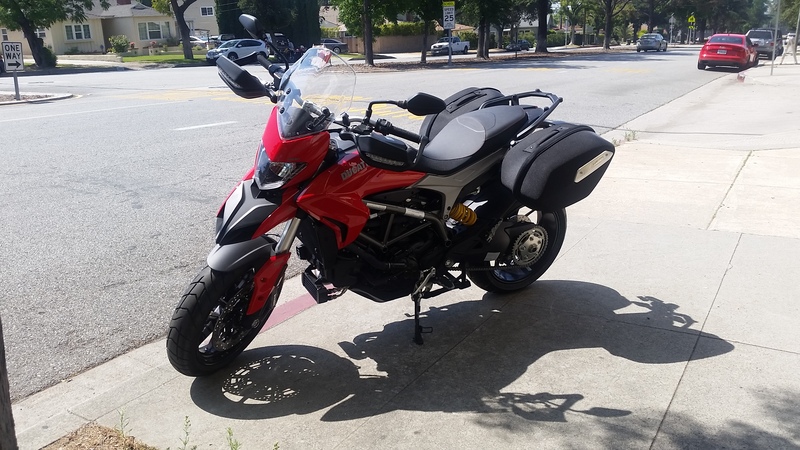 I would go after the Hypermotard but the 35" seat height is just way too tall for me and after sitting on the Strada I know I can make it work with a little re-working of the seat. 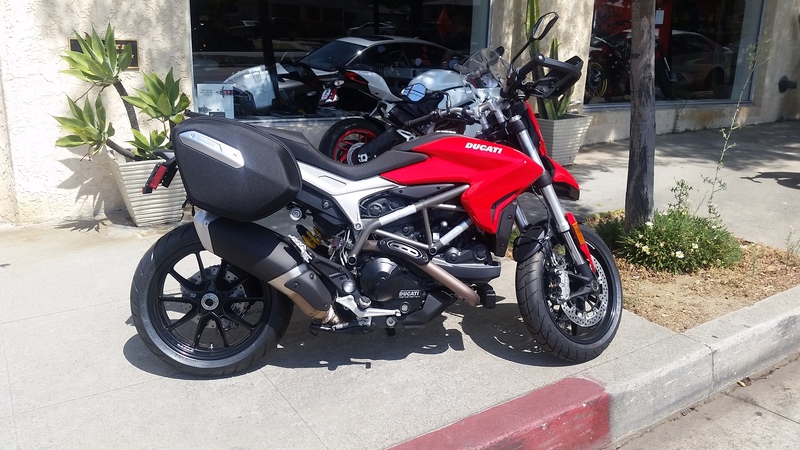 I'm currently looking at a new '16 Hyperstrada 939 in red as well as a used '14 821 in white. If my Tiger doesn't sell by the end of the week I'll probably just trade it in on the new one. I was looking at new and used Tiger 800's too. Then randomly sat on a used Hyperstrada at the dealer. It was high miles and had been there a while. Did a test ride and was impressed. But I let the dirt bag sales guy hang for while. Went over his head to his boss, made a SUPER GOOD deal on the Strada. I love it. I'm only 5'6" so actually fits me well. Seat does need help. I'm looking for a solution myself. I'm still learning my Strada but things coming along nicely. Very easy to ride, confidence inspiring ... and SO FUN! Last edited by Hyp Noob; June 12th, 2017 at 01:51 PM. The Tiger really is a great bike. That 800cc triple is pretty amazing, specially once it's got the Arrow exhaust & tune. It does feel heavy until you get moving, then it handles surprising good. But, like I said, I just won't be using it how it was meant to be used and I think the Hyper will be a better fit for the riding I'll be doing. Get the white 821 simpler, lighter, more direct, and I have one so it must be the best:-) White looks better too. I do like the white! However the 2 year warranty would be nice to have. Got it! I'll msg you in a few. Well my Tiger sold a few days ago. I have an appointment on Thursday to test ride the new Strada 939. Since I've already agreed on an otd price with the dealer, if the test ride goes well it'll be in my garage Thursday evening! Oh man you're going to be so stoked. I personally would go for the newer bike, just because it's newer, but the 821 does weigh less. The 939 has a bunch more midrange torque but the top ends are the same. Either way they both have plenty of power and are pretty much the same. Yeah I'm already starting to get excited about it! The main deciding factor for me was the 2 year warranty with the option to extend it if I want. Picked up my new Hyperstrada yesterday. Left the house around 6 yesterday morning and didn't get home until around 7 last night. 4 hour drive down, spent about 90 minutes at the dealer doing a test ride and paperwork, spent another 90 minutes waiting for my brother to get back from uhaul with the trailer, stopped for a late lunch at Firehouse Subs(first time there, they make GREAT sandwiches!) and then headed home. Long day but totaly worth. Went on a quick ride this morning and I love the bike. Crazy how much different it is than riding my Tiger 800. This thing is so much lighter and has more power. I can't wait to get this thing out in the hills!